The following article is from an undated copy of Channel Nineteen, the magazine of RAF Shawbury. 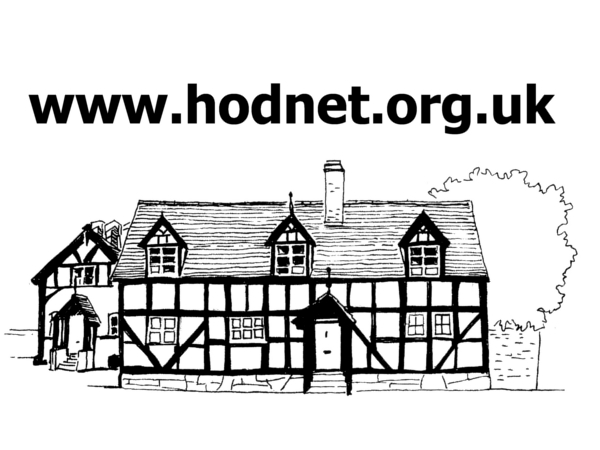 Having safely negotiated the climb from Tilstock, our last stop, up to Marchamley, it is time to catch our breath and coast down the other side of the hill into Hodnet village. A pause at Van Rossem’s Garage to look through the trees opposite will reveal the village cricket pavilion for what it was – a combination mess room and kitchen for No 29 SLG (Satellite Landing Ground) – HODNET. It opened on June 12 1941 and was placed under the control of 24 MU at Tern Hill and was additionally used by the Masters of 5FTS, also from Tern Hill, for circuit flying. 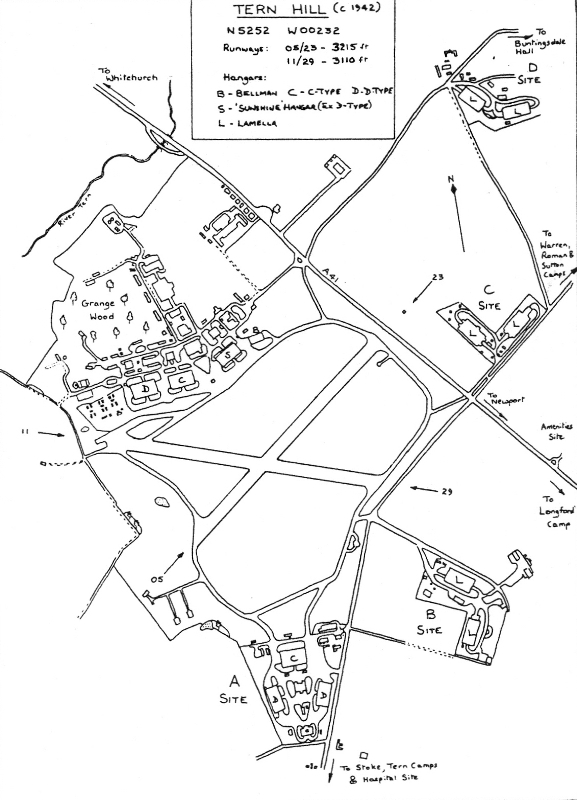 It then passed into the hands of 37 MU at Burtonwood on 20 April 1942 but when that Station was itself handed over to the USAAF, 27 MU at Shawbury took control of Hodnet on July 7. The ownership story has not yet finished; it was scheduled for use by 51 MU Lichfield but not used by them and so returned to Shawbury ownership in November. Five owners in 17 months! Having finally established its identity, what role did it perform? The answer is basically that it was one of storage and dispersal of aircraft away from their home Maintenance Unit, where they were more vulnerable to attacks, in an environment which could be easily camouflaged. 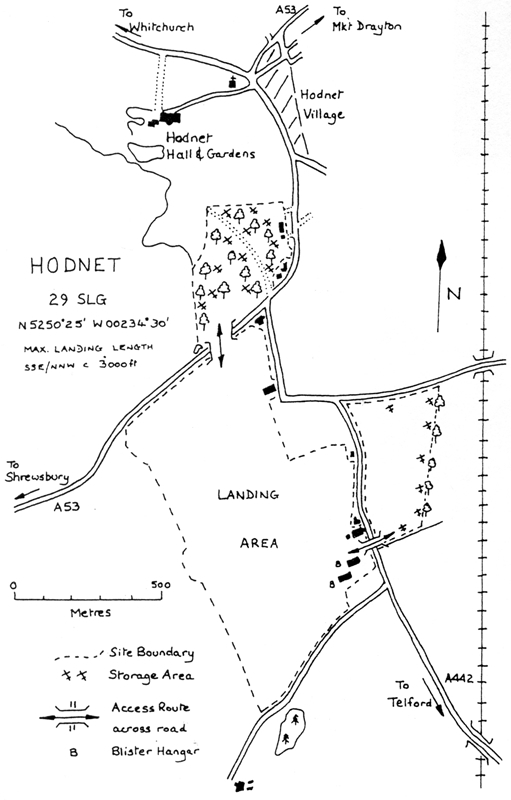 The site at Hodnet was no exception and reference to the site layout will reveal the trouble taken to move the aircraft away from the main landing area where they could be secreted under hedges and trees, often being covered in steel wool as an aid to camouflage. The grass runways were not reinforced with metal tracking as was the usual practice as the commitment was only to store small training aircraft types such as the Miles Master and Martinet. It appears that Wellingtons and Mosquitos were in evidence at some time and in May 1943 there were some 35 aircraft in store there. The gaps in the hedges (which are still visible) show quite clearly where the aircraft were taken across the main roads, and the only other building which is still standing is the Flight Hut/Mess Room by the farm on the A442. Rather derelict now, it is illustrated here to assist identification. Some SMT (Square Mesh Tracking) was laid for hardstandings but this was all removed when the site closed in February 1945. Recent reports received indicate that some Mosquitos were broken up in the Southern corner of the landing area, but the best memories of locals as children are the sharing of tea, toast and jam muffins with the airmen guarding the aircraft. Shortly after the war, three US Piper Cubs were apparently operated out of the strip, but it is difficult to comprehend the landing site now as two small conifer plantations occupy positions in the middle of the longest strip.